The Letters of Pvt. 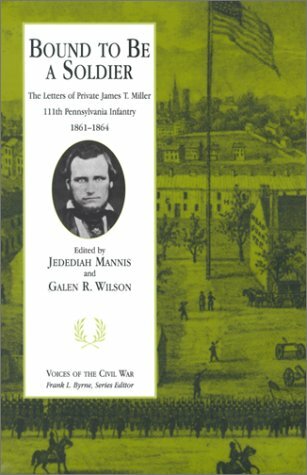 James T. Miller provide a great resource for researchers of the 111th PA. This letter was written by a soldier of the 111th Pennsylvania Infantry from Camp Reed, near Erie, Pennsylvania. This regiment recruited men principally from Erie, Warren and Crawford Counties and assembled them at Camp Reed between September 2, 1861 until the 24th of January 1862 when they were transported to the Eastern Theatre. Unfortunately the portion of the letter with the soldier’s signature is missing and there is no envelope to aid in the identification of the soldier. Neither is there any clue within the letter that might hint at the identity of the author. It seems pretty clear that he was writing to his family or friends back home, however. I will give you a little detail how the soldiers of the 111th Pennsylvania Volunteers get along. I will give you a brief sketch. There is no news of importance here — the same thing everyday. What happens one day, you may be sure will be enacted the [next]. So I will give you the program which commences. In the morning at 6 [is] when the bugle is sounded for the boys to turn out of their bunks. This hard for as there are always laggards in every walk in life and there are plenty of them in the army. At 6 o’clock the order is given for roll call which is by the orderly sergeant of each company and every man must be ready to answer to his name or he will be pricked and have the satisfaction of doing extra guard duty is no slight punishment this cold weather. At 6 ½ we have our breakfast. At 9 you hear that inevitable bugle call for all hands to turn out for squad drill when every sergeant takes his squad which is composed of one-fouth of each company and drills them for one hour. Guard Mounting at 7 the orderly of each company marches his guards to the parade ground where a long ceremony is gone through with the guards are then divided into reliefs to stand their tricks as they call it which are the hours on and four off for twenty-four hours when they are relieved and a new set put on. At 10:30, company drill when each company turns out and drills until 11:30 when they are dismissed. Dinner at 12:30. At 1:30 — which gives the men about time to pick their teeth of army beef — the call is again sounded for company drill which last until 3 pm. Half an hour is then given to prepare fro battalion drill and dress parade when every soldier [is] out in his best. After battalion drill, the orders are read for the ensuing day. Retreat at 8 when all men are required to be in their quarters and answer to their respective names or suffer the consequences. Taps at nine when all lights are extinguished except in the officer’s quarters and all noise are to be stopped. This is the last we hear of the infernal bugle until the next morning when the same thing is enacted again. So it goes day after day without anything to break the monotony. What a life. This entry was posted on Wednesday, August 6th, 2014 at 7:40 pm	and posted in Uncategorized. You can follow any responses to this entry through the RSS 2.0 feed. Dear Griff, Can you please tell my why my great, great grandfather, Hiram Bissell’s photograph has been used in this piece? He is NOT an “unknown” soldier, nor would it appear that the photo is connected to the words from the diary. The words from the diary are NOT his words. I own his diaries and these are not his words. Although I am very proud of my gg grandfather, and his service to Co. E, 111th Pennsylvania, Volunteer Infantry, I don’t like to see his likeness appearing with words written by another soldier. In my opinion, it is not appropriate and is misleading. It does a disservice to the reader and to the solders (the author of the diary and my gg grandfather), as well. I’m not sure I approve of this and may ask you to removed the photo, especially since it is not to be found in the book, “1861: Unknown Soldier of the 111th Pennsylvania Infantry” I’ll stand by for a response. My apologies Paul. As I recall, I placed the photograph of your ancestor (identified as such) there to give readers an idea of what the uniform of the 111th Pennsylvania looked like. I removed it nonetheless as you requested. Hope you enjoy the letter; let me know if you figure out who wrote it.